This question appears regularly on the Captivate forum: how can I insert captured slides in a master slide that has a logo and other information on board. Perhaps this small tip with a step-by-step planning can help you achieve your goal. Some images are attached to explain the workflow. And you will need some maths (you know probably already that I'm a maths-lover) but I'll provide you with a simple rule. For this example I wanted to create a master slide to have a final SWF with a resolution of 920x600 pixels. 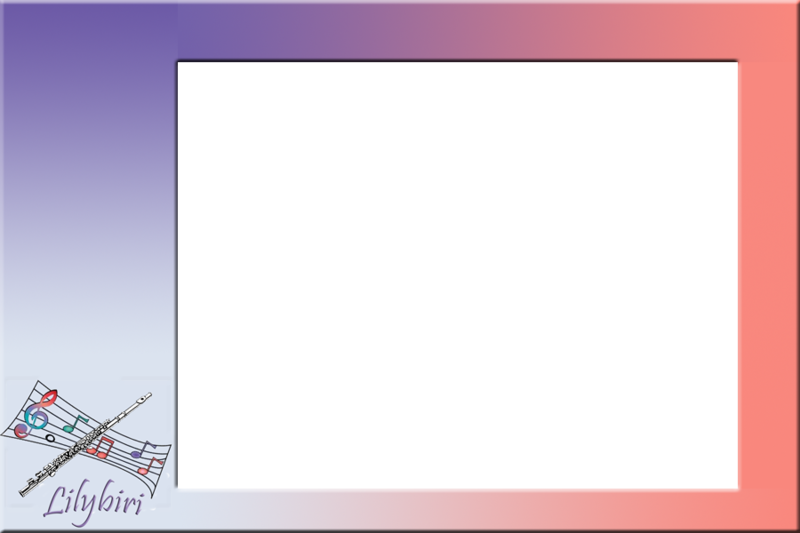 The captured slides were created with a resolution of 640x480pixels, which left enough space to be filled with logo, text, etc. I created an image to be used as master slide. I created such an image in Photoshop but any program that allows you to have transparent pixels will do. This is the first image in the attached gallery. It is exactly 920x600pixels, has left a bar with a width of 200pixels, at the top another with a height of 70 pixels, to the right a bar with a width of 80 pixels and a the bottom a bar with a height of 50 pixels. The transparent region is exactly 640x480 pixels. In the image this transparant region is white. The original captured size and the size after this first rescale are visible in the second and third image of the Gallery. The fourth image in the Gallery shows the situation after the second rescale of the project. Go into the Master slide panel and import the Knockout image either to the Library or immediately to the slide. Be sure it is positioned at X=Y=0 (Properties panel). Apply the Master slide to the captured and rescaled slides. The last image in the Gallery shows the result. The Gallery is not really showing the image as I posted them. The white space that is added after the rescaling has partially be trimmed, and the difference in total size is not visible because all images are rescaled automatically. I'm very sorry about that, should move over to a better blog hosting. Please let me know if this kind of small tip is useful, and do not hesitate to give me suggestions. Do you know the Registration point? For Captivate users that are not familiar with Flash, I first want to explain the importance of the registration point for Captivate objects. If you are a Flash user just skip this, but you will have to know that in Captivate it is not possible to move this registration point. The registration point is always the upper left corner of the bounding box of an object: you see some examples in the first image. The coordinates you are seeing in the Properties panel, region Size and Position are the coordinates of this point. For the math lovers (also for non-math-lovers): do know that the zero point of the coordinates is situated in the upper left corner of the stage. This means that the X-coordinate of the registration point is the horizontal distance (in pixels) from the left side of the stage and the Y-coordinate is the vertical distance from the upper side of the stage. In the image gallery included in this posting I show the registration points for some objects. Why is this point so important? If you use the snap to grid feature, it is the registration point that will snap to the grid. If you use a shortcut key to increase the size of an object, the registration point will not move, it is the opposite corner (down right) that will move. Did you ever use the grid? There is a button to show/hide that grid (or you can use the View menu). The default size of the grid mesh width is 16 pixels, but you can change this in the Preferences, Global, General Settings. If you activate the "Snap to Grid" (with button or View menu), moving an object with the mouse or with an arrow key will cause the registration point of that object to snap to one of the grid points. But did you know that the mesh width is also important when moving and resizing objects with shortcut keys? Using an arrow will move the object (by its registration point) by one pixel in that direction. Using an arrow in combination with SHIFT will move the object 10 pixels in that direction. Using an arrow in combination with CTRL will move the object by the mesh width of the grid, thus 16pixels if you did not change the default valuedirection. Using ALT+RIGHT will increase the width of the bounding box with one pixel (registration point will not move). Using ALT+LEFT will decrease the width of the bounding box with one pixel (registration point will not move). Using ALT+DOWN will increase the height of the bounding box with one pixel (registration point will not move). Using ALT+UP will decrease the height of the bounding box with one pixel (registration point will not move). If you combine SHIFT+ALT+Arrow: instead of 1 pixel the size change will be in steps of 10 pixels. If you combine CTRL+ALT+Arrow: instead of 1 pixel the size change will be the mesh width (16 pixels if you did not change the default value). As with moving those shortcut keys also work with a multiple selection. Use SHIFT+LEFT to align duplicate's left side with the original; then you can use one of the other shortcuts to move the duplicate down. Here is a captivate training to practice this workflow. A couple of weeks ago I blogged 'Curious about variables in Captivate 4&5', pointing to an introductory article on variables. Was a little bit wondering why no one blamed me yet for not keeping my promise to publish a second part, explaining how to extend this power by using (simple) advanced actions. I always try to keep promises, but had a lot of deadlines to meet. Just hope that you will be as captivated as me by the way you can control your movies using those actions! Before plunging into this subject, I want to thank those who commented, tweeted, e-mailed as a reaction to my previous blog post 'To blog or not to blog?' A lot of those reactions really touched me, and they provided me with the energy needed to get on with the blog. Please, feel free to suggest new subjects or react to the postings, I would appreciate it a lot. If you have been reading one or more of my articles, you already know that I'm addicted to labeling all kind of objects in Captivate. This is partly but not only due to my playing a lot with Advanced actions. I will try to explain the reasons for spending "precious" developing time to label master slides, slides, objects, effects, audio etc. Although the screenshot in this posting are from Captivate 5, a lot of the reasons mentioned are also valid for earlier versions of Captivate. Where necessary I will indicate that it is only valid for version 5. Screenshots are in a Gallery at the end of this post. 1. Why do I label slides? First of all, it is so much easier to find a particular slide in the Filmstrip and in the Branching view. For complex projects I use the Branching view a lot and as you can see on this first screenshot if feels more comfortable to judge the different workflows in the project when meaningful labels are visible. If I'm working with slide groups I may just label the slides within a group with the group name followed by a number, especially if the slides are the result of capturing some software process. Tip for CP5 users: do you know that it is possible to label slides in this Branching view using the HUD (Heads Up Display)? In this HUD you can also define the action 'Jump to'. Do not forget to confirm either labeling and/or jump action with the positive tick. Since I'm often using a Table of Contents in my projects, the navigation for the user will be facilitated by labeling the slides as you can see in this second screenshot. For navigation in a non-linear project assigning the action 'Jump to slide X' is often necessary, and it is so much easier to jump to a labeled slide than having to search for the right number of a slide one wants to jump to. This is even more the case when inserting this kind of action in the Advanced Actions dialog box. And, more specific for reporting reasons, the Advanced Interaction view will show the slide labels as well. 2. Why do I label objects? Let us start with Non-interactive objects (that cannot be scored by default): Text Caption, Rollover Caption, Rollover Image, Highlight Box, Zoom object, Image, Drawing objects. Labeling those objects is interesting in all CP-versions if those objects are used in actions like Hiding/Showing and certainly if those actions are in Advanced actions (CP4 and CP5 only). Only for CP5 users: did you see that object labels are visible on the timeline? This should be stimulating to label them, at least when you have a lot of objects on a slide. Try to select one out of all those Click boxes (see screenshot) if they are indicated by their default names Click_Box_x! Only Text Captions are by default easily recognizable on the Timeline because the text (or part of it) is visible. Same reasons are valid for Interactive objects (that can be scored by default). Only for CP5 users: extra advantage is objects labels will be visible in the Advanced Interaction view! 3. How do I label Advanced actions and variables? Here you have no choice: each advanced action and each variable has to be labeled. Some tips? I will always start a variable name with v_ to make it clear that this is not a simple object. In dropdown lists where system and user variables are mixed up, all user variables will then be grouped together. If the action is to be triggered as a success action for a Click Box and there are different Click Boxes with similar actions, I will choose a similar name for the Click Boxes (such as Yes1, Yes2,...) and the corresponding actions are labeled CB_Yes1, CB_Yes2,... Attributing the correct action to the corresponding Click Box is then a lot easier. If you are not yet persuaded that labeling has a lot of advantages, I give up ;-) But you have to know that for most project I will also label master slides, decisions in advanced conditional actions, voice over clips, customized effects and object styles. Here is the image gallery: Branching view, TOC, Timeline and Advanced Interactions view. At the end of this posting I will offer a small 'toggle' tip. Feel free to jump my (first) personal reflections and get immediately to that tip. Just one month ago I started a 'trial period' with this blog, and it is the moment to decide if I will continue? Why did I start? Using the Adobe Online Publishing application I had published several articles, tutorials about new and improved aspects in Adobe Captivate 5. But those articles were not that easy to find, and I felt a little bit frustrated. Several kind friends offered to post a link to them on their website/blog. Publishing an article takes quite a lot of time. And I had so many ideas, tips I wanted to offer to the Captivate Community. I thought that a blog was an easier and quicker way to achieve that. Have been tweeting small tips, sometimes adding a screenshot. But 140 characters (or less if using an image) are limiting of course. As I am rather active on the Captivate user forums, some questions are repeated by several users, and being able to point to an example on the blog seemed to be a better solution than having to create static screenshots to try to explain each time. Until now I only rely on my intuition and experiences on the user forum to choose subjects for the articles and for the blog postings. The articles did get a few comments, and I was hoping to have a more active interaction with readers on this blog, to get feedback, eventually suggestions for new subjects. Positive: I am really amazed by the number of views of this blog; but is this proving that it did help someone? Negative: no interaction at all, no comments. Being a teacher that gets upset when a class of students is silently absorbing without any reaction or question, this is hard to deal with. Here is the reason why I am wondering if I would be able to go on with this blog. This morning I sent a tweet asking for advice. Thanks to Rick, Jason, Jenise and Dieter for their reactions. Please, if you have read this until now, send me a tweet (@Lilybiri) or post a comment. Tell me what subjects you would like me to blog about, concerning Adobe Captivate and the eLearning Suite. What do you think? No, I did not create a conditional action to be triggered by those buttons at all. To be honest, I got this suggestion from the Adobe team. You only have to create an Standard Advanced Action for each button. And this action has only one statement, an Expression. In this screensho you see an example (for the first button 'Playbar'). If the system variable cpCmndShowPlaybar = 0 (playbar is invisible) this Expression will result in 1 and the playbar will get visible. But if the variable = 1 (playbar is visible) the Expression will result in 0 and the playbar will be hidden. The actions for the two other buttons are similar, but use the system variables cpCmndMute (for the Mute-button) and cpCmndCC (for the CC-button). 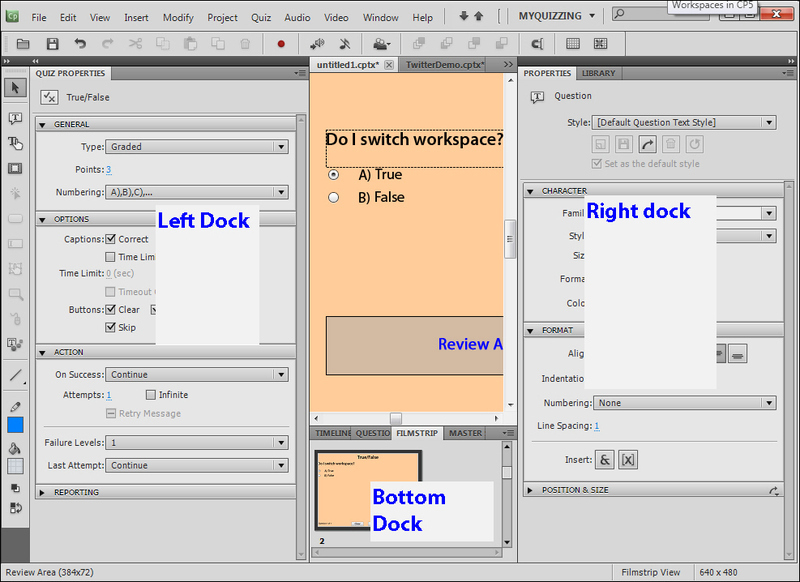 In Captivate 5 workspaces are introduced, to make its interface line up with other Adobe applications. In a workspace panels are arranged normally in groups and have a fixed place in one of the three available docking stations or docks: the left, the right (both vertical docks) and the bottom (horizontal) dock. There is no docking station at the top, where you have the menu and a couple of toolbars. It is always possible to make a panel floating, and to put it elsewhere outside of the docking stations. Which workspaces are provided with Captivate out of the box, and what is their arrangement and goal? I'll try to give some indications, since this is apparently missing in the Help. This is the default workspace that appears when you start Captivate for the first time, or when you have not changed any workspace arrangement. Probably you will be working a lot in this workspace because it has the most common used panels on board for working with a Cp-file. in the left dock you have the Object toolbar (call it the Toolbox myself) and the Filmstrip. If you turn the Filmstrip into a floating panel, you can adjust its dimensions and it doubles as the former Edit view. Note: do I use this workspace? Yes, a lot, but I customized it by adding the Master slide, Slide notes and the Effects panels to the bottom dock. When working with effects I will turn the Timeline in a floating panel and put it at the top of the stage. This is the same arrangement as the Classic workspace, but the Skin editor panel is added as a floating panel. It is meant to be used when you are editing the skin, TOC and borders included. Note: do I use this workspace? No, for this goal I just open the Skin editor (SHIFT-F11) on top of my customized classic workspace. Perhaps because this Skin editor is not used that many times during the editing of a project. This is also the arrangement of the Classic workspace, this time with the Branching view on top as a floating panel. This is clearly meant for navigation in more complex projects, where the linear Filmstrip is not sufficient. I think that the Branching view is really underestimated and am using it a lot. Note: do I use this workspace? Yes, for more complex projects it allows me more quickly to pop up the Branching view than having to use the Window menu or trying to use the complicated shortcut key SHIFT-CTRL-ALT-B (cannot do this blindly, my hand doesn't like a combination of more than 3 keys). This workspace is recommended while working with Question slides. When editing a Question slide you need both the Quizzing Properties (configuration of the Question itself) and the Properties (for formatting, layout of the Question slide) a lot. That is the reason that they have been separated between the left and the right dock. Question pool is right available in the bottom dock too. Note: do I use this workspace? Yes, and I customized it a little bit: added the Master slide panel to the bottom dock and the Library to the right dock. When checking the scores I will often open the Advanced Interaction view as a floating panel on top of this workspace, but that is easy using shortcut F9. You see my customized workspace for Quizzing in this screenshot. This is again a Classic workspace with one modification: the Comments panel is added to the right dock, not in the same group as Properties and Library but in the bottom part. Note: do I use this workspace? No, certainly because until now I did not have any reviewers. But I think that I would prefer to have the Comments panel in the left dock and put the Filmstrip in the bottom dock in that case because the properties panel needs all the 'real estate' it can get. Similarly to the Review Workspace the bottom part of the right dock is here filled by the Widget panel. It is meant to be used when inserting Widgets. Note: do I use this workspace? I have tried to use it, but changed it quickly and docked the Widgets panel in the left dock grouped with the Filmstrip. The bottom part of the right dock is too small. I really do like the new feature in the eLearning Suite 2 that allows you to edit the source file in Photoshop from Captivate. In Captivate 4 you had already the possibility to import a layered Photoshop file, indicate which layers you wanted to use. But after import each layer was converted to a PNG-image. If you wanted to change an image, you did have roundtripping to Photoshop and it worked fine. But if you had to change multiple images, that were all imported from the same Photoshop file, you had to repeat this 'trip' for each of those images separately. In Captivate 5 you can edit all layers at once using the 'Edit Source PSD file'. If you never used this possibility I created a small demonstration to show the workflow. In one of the Photoshop-files I created with reusable objects I have two buttons, using five layers as you can see in this screenshot. When imported in Captivate, as you'll see in the demonstration I can create each of the buttons using three images: an Text image (Nee or Ja), a background color (RoodNee or BlauwJa) and the Overlay (which I use for both buttons). Both text and background color have to be changed. Similarly I created Photoshop files with all kind of arrows, with text balloons etc. The idea is to be able to reuse those items, and when necessary to change quickly the color by using the roundtripping feature I described in the demo. Conclusion based on multiple scores: based on scores obtained in the previous article, you will use one Advanced Standard and one Advanced Conditional action to show the conclusion. 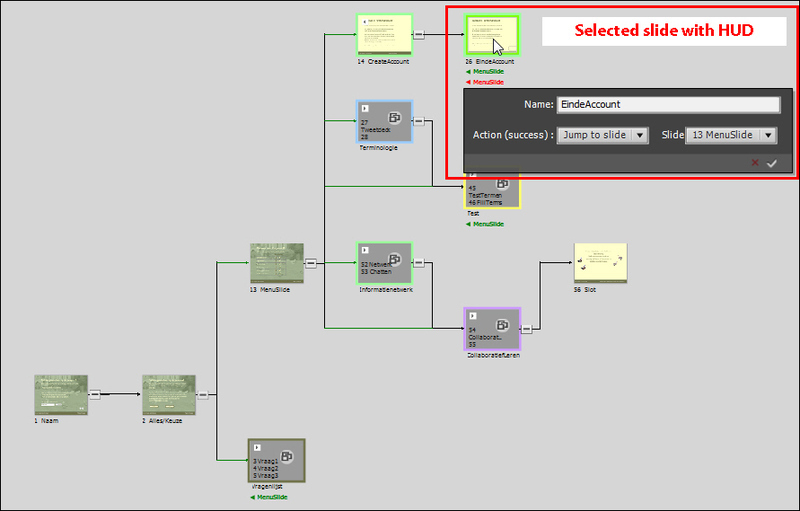 I meant this article to be an introduction to the new User Interface of Advanced actions. Create question slides with partial scoring and customized feedback: one of the issues with the default Captivate Question slides is that the user never can get partial scores if his answer is partially correct. In this article I created a hotspot question slide with multiple hotspots and the user can get a partial score. Create customized feedback: in this video tutorial you will learn how to use an Advanced Conditional action (with multiple decisions) to show differentiated feedback based on the score of a Quiz constructed with the default Question slides of Captivate. This video is meant as an introduction in the terminology and workflow of Conditional actions. I hope this can help to start using Advanced actions. Please, feel free to comment and suggest other usecases. Effects allow you to apply special formating such like dropdown shadows and bevel and to create simple animations without having to use Flash. In this tip I will show how you can adapt motion paths when using motion effects. It is possible to save customized effects and use them again in the same project or in another one. Once you have re-used a customized effect, it will be added in the dropdown-lists to a special category, labeled Custom. If you want to see the custom effect also in the Advanced actions dropdown list, you'll have first to apply it in a time-based version to an object. It is also possible to reorganize the effects in folders, but this involves deleting the Preferences folder in order to have this reorganisation reflected in the dropdown lists of the Effects panel. I created this demonstration SWF to show how to customize a motion effect, to save and to reuse it. Curious about Variables in Captivate? Since Captivate 4 you have access to a whole bunch of system variables, and you can create your own variables. It is possible to change variables and thus taking more control over your Captivate-movie. If you feel uncomfortable with or puzzled by this introductory paragraph, please read on. Probably you never used a scripting language, or you never liked... maths? But I think it is really worthwhile to get some hints about the power of those variables are and their possible use. For this reason I did create a starters tutorial, with practical examples and ... without writing any script (called Advanced actions in Captivate). If you want more later on, I do plan to write a second part, where simple advanced actions will be used to give you even more power with the variables. All examples can be used in Captivate 5 as well as in Captivate 4.